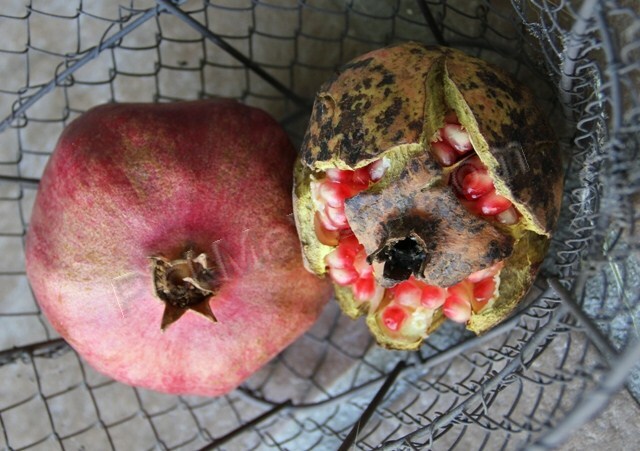 Pomegranates (Punica granatum) have become popular lately. The juice can now be found in almost any supermarket. That’s a wonderful thing because it’s delicious and loaded with antioxidants. However, do you actually buy the fruit when they’re available or do you just admire them and walk past them? I think most people don’t buy the fresh fruit because they know the seeds can pop and spray you with red juice when you try to open them. They seem like a complicated fruit but they’re not. 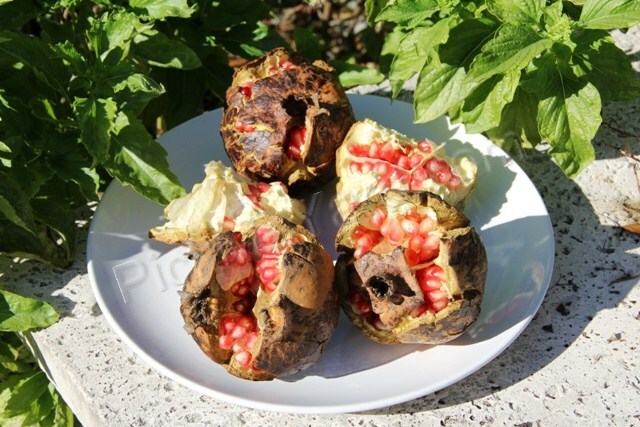 There are lots of tips on how to cut a pomegranate such as cutting them in a bowl of water. My tip is to throw on an apron or old t-shirt and just dig in. I cut mine in half with a sharp knife and then tear into it from there. If you’ve never had a fresh pomegranate, you’ve got to try it. Pomegranate seeds are better than candy to my kids…that means they’re really good. I have a couple of really picky eaters. They love walking around the yard while digging into a pomegranate. Pomegranate seeds have lots of fiber. I’ve always been told that eating pomegranate seeds will expel parasites too. That’s an added bonus. Well, we do live in Florida and run around barefoot all year. 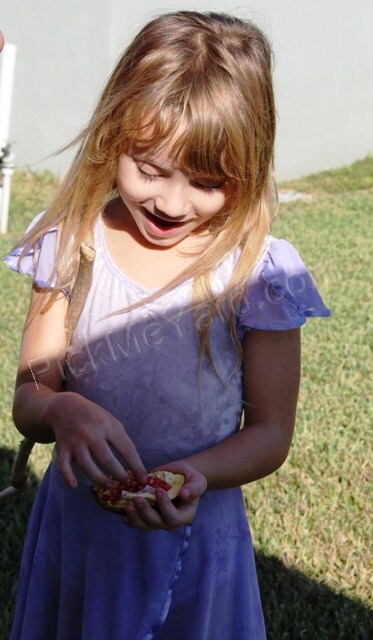 We’ve been growing pomegranates in our yard for several years. The trees are small and actually look more like a tall bush. My trees never look healthy, but I don’t give them any care at all. Okay, I do put goat manure around the base of the tree but that’s it. I don’t recommend neglecting your trees this way. However, even with all my neglect, our trees give us some glorious tasting pomegranates. They look horribly ugly, but they taste deeelicious. That’s a pomegranate from the grocery store on the left and our ugly (but super sweet) homegrown pomegranate on the right. There are many varieties of pomegranate. 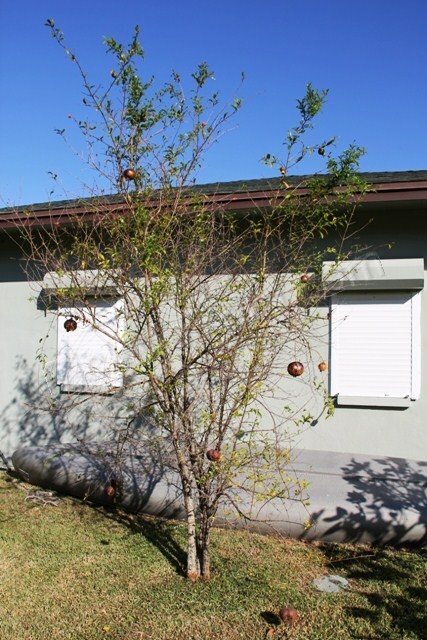 Click here and here for some great information on growing pomegranates in Florida. They can take the humidity, but they prefer hot, dry summers. If you have a deer problem, take note that deer love to eat pomegranate trees. Also, they do have thorns. A plate of homegrown pomegranates… strange looking. My favorite recipe for pomegranate seeds is persian rice with pistachios. I enjoyed this dish at a Persian restaurant several years ago and have been making it at home ever since. Check out this blog called My Persian Kitchen for the recipe and some fantastic ideas for Thanksgiving dinner. The seeds sparkle like precious gems and taste like sweet candy. Eat more pomegranate.